Tight budgets have county and state officials looking for ways to deal with frequent fliers, or repeat offenders cycling through the court system for low-level felonies and gross misdemeanors — many because of chemical dependency (Austin Daily Herald). The Herald also reports that in 2007, Mower County spent a record $200,000 on chemical treatment for repeat offenders. The southern Minnesota county has been able to bring those costs down in part by providing homeless alcoholics public housing that tolerates drinking. The Pioneer Press reported that a homeless alcoholic can end up costing tax payers one million dollars when you add up jail time, treatment and other social services. The same report cites surveys that indicate the wet house approach can cut costs by 50 – 75 percent. Mower County is hoping to utilize a wet house that’s being built in nearby Olmstead County. The deficit Dayton and Minnesota lawmakers must fix this year is worse than all states but California, Illinois, Nevada, New Jersey, Oregon and Texas, a report from the Center for Budget and Policy Priorities shows (Duluth News Tribune). The city is planning to raise the U.S. Highway 212 levee by 4 to 5 feet and the 1969 dike by 2 to 3 feet, according to City Manager Steve Jones (West Central Tribune). Many aspiring Republican presidential candidates are going to great lengths to avoid the spotlight, but not Tim Pawlenty. He is doing whatever he can to step into it (New York Times). River Cities Inc., a Minnesota-based company, is in the process of securing funds for a new luxury condominium barge that will travel up and down several U.S. waterways including the Mississippi, Ohio and Illinois rivers and the Intracoastal Waterway. Residents would enjoy waterfront living and could avoid property taxes (Times Picayune). McNeil was among eight stadium workers fired by concession management last September after being cited in a sting operation during the Twins’ final home series of the 2010 regular season (Pioneer Press). After most of the 11 young conductors from around the world had arrived at the Duluth Superior Symphony Orchestra’s offices on Friday — some were delayed by a flight cancellation in Detroit — Markand Thakar interrupted their get-to-know-you with a bit of protocol (Duluth News Tribune). Gallagher’s manager says the comedian has been released from St. Marys Hospital in Rochester where he was treated for a minor heart attack (Rochester Post Bulletin). Should Minnesota lawmakers pass a plan to cut public benefits too? Sometimes the topic at Insight Now is straight ahead without needing to do much explaining. Instead, we’ll let Minnesota Public Radio News reporter Tim Nelson explain the proposal before Minnesota lawmakers on worker benefits. The choice for Sen. Mike Parry of Waseca is simple: He’d rather make employees pay more of their pension plan than cut jobs because of the state’s multi-billion budget deficit. Union leaders say this amounts to a unilateral pay cut. And they say that public employees here, unlike their Wisconsin counterparts, already kick in between “5 to 10 percent of salaries” toward pensions. Two questions: Why shouldn’t public employees have to kick in more for pension benefits when the state runs a recession? 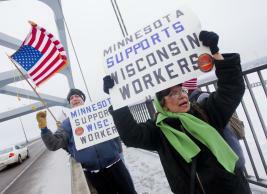 Why wouldn’t raising taxes on Minnesotans be an alternative to such a proposal?